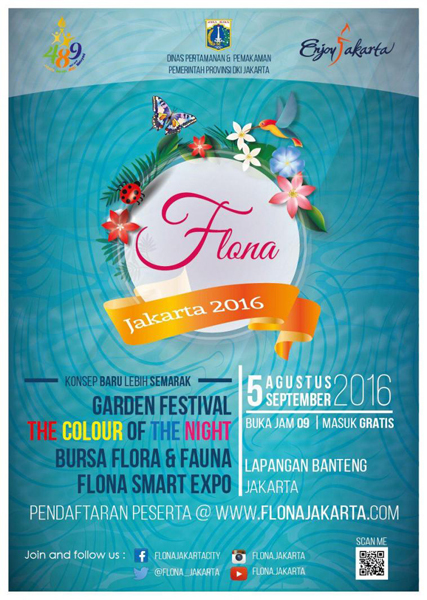 The Jakarta Parks Agency will hold the Festival of Flora and Fauna in 2016 at Lapangan Banteng. Flora and Fauna exhibition is a permanent activity that has been organized by the Government of Jakarta since 1985. Flona Exhibition 2016 will be celebrated with the Garden Festival and brought the six themes, namely the Innovation Garden, Ethnic Garden, Smart Garden, Futuristic Garden, and Fantasy Garden which hopefully will give the impression to visitors. All of the park will appear vibrant and colorful in the attractions of The Color of the Night with a mix of lighting system to be enjoyed at night.